When Paul Pacult published his massive book of spirit reviews "Kindred Spirits 2" in 2008 he held a tasting session at Keen's steakhouse in Manhattan modestly titled "The Ten Greatest Spirits in the World". It was an astonishing night but perhaps the biggest surprise and delight was the penultimate selection - a rich and buttery waxy whisky with a luscious bananas foster flavor and an amazingly polished and elegant manner. I had to be told twice that it was an Irish whisky. Most in attendance had the same incredulous reaction. "Did he say an IRISH whisky?" That was my introduction to Midleton Very Rare - the flagship of Irish Distillers (a division of Pernaud Ricard) - the makers of Jamesons and Redbreast (among others). Color: rich old gold with coppery / amber glints. Nose: A very distinctive and Scotch-like nose like a very elegant Highland malt: salted butter, butterscotch, toffee malt, heather and gorse, clover honey and bee's wax and a whiff of distant sherry. Entry is like sugar sautéed in sweet butter then banana (bananas foster). Midpalate lays sweet cream, peppery heat, a hint of mint, yellow and red fruits, quince, gooseberries and a touch of pineapple on top of a well built chassis of richly honeyed firm cereal. Finish is gentle and drying - long and clean and elegant without a trace of burn or bitterness. Over the long finish the highland Scotch quality keeps showing itself in the malty-sweet and lightly oaky and salty combo of flavors. Hard to believe it's an Irish, but the midpalate hint of mint is a diagnostic. Dryer, leaner, tighter in structure - hewing close to it's sturdy frame of robust cereal grain flavors - this just comes across as rich, refined, and poised. Bottled at 40%, this richness and long finish is coming out despite dilution. This stuff is $118 at Shopper's Vineyard and $135 at the local store. Is it worth it? This is a sweet and gentle 40% abv dram - an IRISH whisky. Did I mention that it's a BLEND? It's not a "bomb" or "monster" of any description. It isn't "intense". Rather it is "elegant", and "refined". 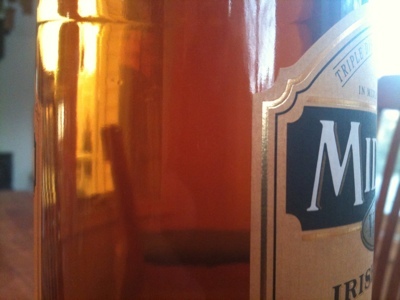 Let's put it this way, my companion that night has had three bottles and I have restrained myself to only two. Top of the Irish by a country mile and a convincing argument for why Irish whisky deserves a spot among the great spirits of the world. A five star if there ever was one. That 2008 Paul Pacult event sounds fantastic. And could he pick a better venue? The bar at Keen's is one of my favorite drinking destinations in NYC. Not that I get to drink in NYC very often, but the two times that I've been there have been superb. Such a great atmosphere. And the whisky selections are simply mind blowing. If only I had enough cash to really take advantage of all that they had to offer. Oh... and the food is pretty good too. As far as the Midleton's, I have tried it once or twice and agree 100%. It is a fabulous whiskey for sure. May have to pick up a bottle one of these days. So many whiskies, so little cash! G-LO, thanks for dropping by my fledgling blog! I've been a fan of your blogging for months and consider you a muse. It's a great pleasure to meet you. Paul Pacult is also a major muse of mine. He's a really fun whisky showman. I've been to half a dozen of his "Master's Series" tastings and they are all a blast. They generally run $95, and include a flight of 7-10 selections. Cheese and crackers (and it's Keens - so the cheese is real cheese) and hors d'oeuvres. There's often an brand ambassador or other interesting presenter. It's great fun and actually a really great value when you add up all you get. E.g. the Glenmorangie event had a dram of every expression they had out at the time and ended with a dram of Pride - which runs $3500 a bottle! Keens is one of the top 5 steak houses in NYC (the only place to get mutton and the porterhouse is unsurpassed)- and it's more than that: it's a living museum of a now-vanished 19th century Herald Square theater district culture. I'd recommend it to anyone visiting NYC. The fact that it has a superb list of Scotch whiskies available by the dram is just a plus. It's also just a few blocks from where I work (The Morgan Library - a superb vestige of Murray Hill civilization). As for Midletons. It's tough to rationalize that kind of cash for a smooth ambling Irish whisky. If there ever was one that earned it - it would be this one. If I hadn't tried it first I never would have gone there. Tastes change and I've grown more interested in powerfully peated expressions and big bourbons. I'm probably further away from spending long green on "tops in "smooth"" selections than ever. (e.g. I don't drink too many Speyside malts - and the few I do are sherry bombs). 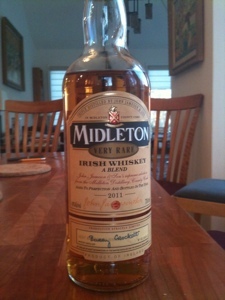 All that being said I'll probably always have a bottle of Midletons around. It's just something totally unique that I have found myself very deeply in love with over the years. A muse? Me? That is a HUGE compliment! You are too kind. You work up the street from Keen's. You lucky lucky man! As I said, the wife and I have been there on two occasions and I absolutely love the bar. On our first visit, we ate in the dining room, but since we were trying to keep expenses down, did not go for the full dinner menu. I will say that there was a rather shady looking guy (turns out that he was a Sicilian like me) eating an incredibly huge Porterhouse. It looked spectacular and I immediately regretted not splurging a bit. During our second visit we had the Short Rib Salad and the Keen's Burger while seated at the bar. Both were fantastic! We were in NYC last weekend and decided to stay in Soho (we stayed in Midtown during our last two visits). While SOHO was a less convenient location, it did put us within walking distance of The Brandy Library (highly recommended to me by The Whisky Woman). I have been trying to get there for the past three years and finally had the chance to pay them a visit. It was like I died and went to bar heaven! Such a spectacular place to drink. I hope to make it back there very very soon. With regards to the changing palate, I completely understand where you're coming from. While I too prefer the bigger Bourbons and SIngle Malts, I have also learned to appreciate the more subtle spirits over the past few months. They take a little longer to appreciate, but they are definitely worth the effort. Much like the Midleton, I consider them a fine change of pace. You are a blogging mentor - own it. We're all pulling ourselves up by the bootstraps. You have an awesome collaborative blog with a wide and eclectic range and a really fun and youthful energy. I'm near Keens - but I seldom go. I always think I should go more often. Every time I do I'm impressed. I had my bachelor's party there in 1998. We had 30 year old Bowmore, Dallas Dhu (a closed distillery that was becoming rare even back then) and other amazing drams. Yet, I've never heard of the Brandy Library. Thanks for schooling me about major resources in my own town. I need to read more Whiskey Woman. She is very wise in the ways of NYC resources and the US craft whiskey scene. Well hello boys! Thanks for looping me into your conversation! (and for the "very wise" credits! haha, that made my day) I'm just a gal who likes to drink and finds pleasures in sharing my adventures and favorite drams & spots along the way. Josh - it's nice to meet another NYC whisky blogger. Shockingly, there aren't many of us! It felt like a wave of calm and relaxation entered my body when I set foot into The Brandy Library. Our now mutual friend The Whisky Woman posted an excellent review of the place. Here's the link: http://thewhiskywoman.wordpress.com/2011/05/11/brandy-library/. As the Brits would say, her review is "Spot on!". Have you been to St. Andrew's in Midtown? Though it lacks the atmosphere of Keen's and The Brandy Library, they do have a great selection of whisky and craft beer. Marginally more affordable too. At least I think it is. I had a few drinks in me the last time I was there, so the numbers may have blurred a bit. And just FYI, I love how all of the whisk(e)y bloggers have found each other via the interwebz! Great fun! One last thing... if you haven't done it already, get a Twitter account. I thought it was utter nonsense at first (I am guilty of tweeting utter nonsense now and again), but it is truly a great resource for whisky info and a great way to interact with distilleries, writers, bars, etc..
Whisky Woman - so glad to meet you. You are most welcome any time. G-LO's tip about your excellent post describing the Brandy Library was a revelation. Excellent blogging and a terrific recommendation. G-LO - thanks for the tip about Twitter. I've had an account for years but hardly use it. I think I can understand its connection to blogging. I'll try to get wise asap. Thanks, too for the tip about St. Andrews. I just looked at their whisky menu and it's impressive and very close. I'll check it out and report back.